Within Teamwork Projects, you can create expenses so that you can add them to invoices along with time logs. To create a new expense, go to the Billing area of your project. In the upper right, choose the Add Expense button on the right. You can enter details such as expense name, cost, and date. 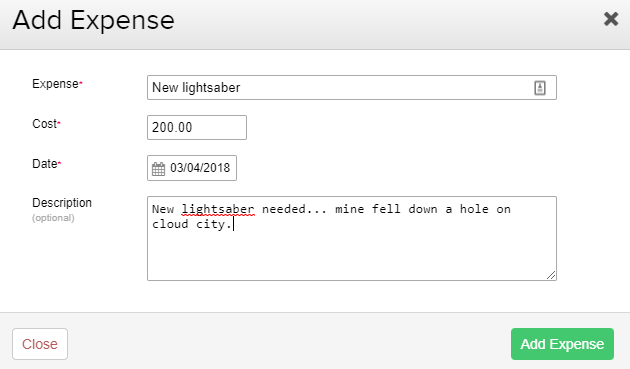 Expense: Enter the expense type. Cost: Enter the cost relating to the expense. Date: The date of the expense. Description: An optional description of the expense. Once you have created an expense, you'll see it listed in the Unbilled Expenses area and you can add it to an invoice.